Thank you so much for the opportunity to join you, the State Board of Directors and also members of BCHI at your annual state convention! It was great to meet you all and learn more about the great work the chapters are doing throughout Idaho, as well as share information and answer questions about the Forest Service’s saw policy. I’m always amazed at the dedication and amount of volunteer and partner work that BCH members give – you are all very much appreciated not only for the time and talent you give, but also for your passion for public lands. Thank you! • The first is a letter from our Regional Forester here in R1 announcing our new Northern Region Wilderness Skills Institute, that will be occurring in Powell, ID the week of May 21-25; additional information is also in this email if folks scroll below. If folks have an interest, I would recommend signing up soon, per the highlighted link below, as I anticipate the sessions will fill up fast. • The name of the R4 Saw Program Manager is Brian Burbridge and he can be reached at phone: 801-531-5320 or bburbridge@fs.fed.us. I would recommend that local chapters first contact the primary ranger district staff that they work with to see about saw training opportunities locally; if none are available, the district staff can work with/contact Brian to see about setting something up or seeing where trainings are being offered that folks can attend. • The R1 Saw Program Manager is Todd Wilson. He is working with local ranger districts directly to set up saw trainings so I would recommend that chapters on the Idaho Panhandle and Nez Perce Clearwater NFs work directly with their local unit contacts first or with BCH volunteer sawyers Jerry Lange and Joe Robinson re: setting something up. o It’s important to note that BCH volunteer C level instructor or evaluator sawyers need to coordinate with local FS units to set up cutting areas for training; volunteer sawyers also need a letter of designation from the Regional Saw Program Manager in order to instruct/evaluate. 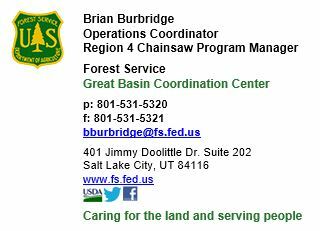 The FS (either FS line officer, Regional Saw Program Manager, or delegated forest/district saw program coordinator) is the “certifying official” who signs the saw card, based on recommendations from the saw evaluators. • Conservation United (www.conservationinsurance.com or phone (844-559-8336) is the company that, as of a year ago, sounded like they also offered insurance (workers compensation) coverage for volunteer and partner groups using volunteers. They provide insurance coverage for many youth corps groups around the country, including youth corps using veterans engaged in hazardous fuels reduction (i.e., chain saw) work, and they had indicated to me that they also can provide insurance for volunteers. Not sure current status/current policies they offer but folks might want to visit with them to see what they currently offer. Hope this is helpful for folks. Again, really appreciated being able to share some information on the saw policy and spend some time together. I look forward to seeing you all again soon!